A stunning sailing ship will add a great touch to a nautical themed event, and this one is a cut above the rest! Enchant your guests with a totally luxurious, upmarket and sophisticated favour. This beautiful silver sailing boat will bring a classy touch to your event tables. A small ship with two sails and a flying flag sits on top of a bottle stopper making this a fabulous functional item. Each stopper comes packaged in a clear display box with a lovely soft toned wood grain design. An ancient world globe and a rope detail complete the look. The base of the stopper has a black rubber gasket for a tight seal. 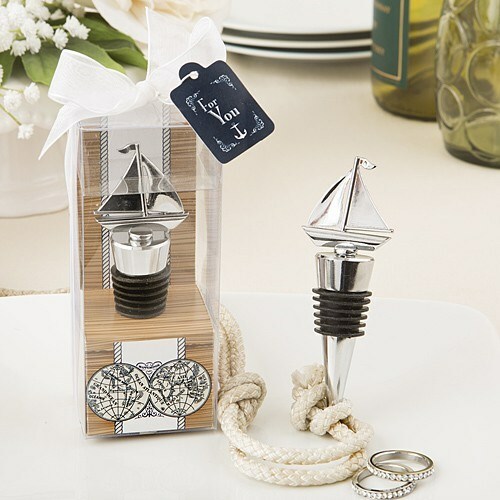 Add a sparkle to your ocean themed occasion with these shiny chrome metal stoppers. Your guests will be delighted to take one home. Stopper size is 4" x 1 1/4"